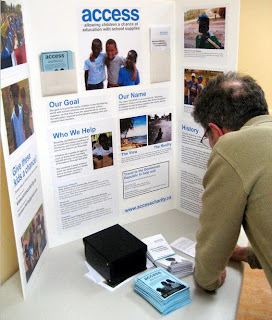 On the evening of Thursday, February 22, 2007, Daniel Francavilla presented at a St. Mary’s Church Justice & Peace Committee gathering, to share experiences in the third world and discuss the organization, ACCESS Charity. An informative display board was set-up with ACCESS flyers and brochures available. The evening was part of St. Mary's Church Lenten Reflections for 2007, which included a representative from Dr. Simone's Canadian Food for Children program.